I have been an advocate of a United North America, that is of the United States and Canada for nearly as long as I have lived on this continent. The case for union is, to me, self-evident, but this post is a review of Diane Francis’s book Merger of the Century. Over the years, there have been very few books taking up the cause of continental union, and as far as I know, these were mostly low key books by relatively unknown authors. The prospect of a full length book by a well known personality, business columnist Diane Francis was therefore a cause for celebration. I bought it as soon as it was published. Unfortunately disappointment set in right away. While thoroughly researched and footnoted, Francis’ reasoning is fatally flawed, and badly argued. To Francis, the Union of North America seems to be primarily a matter of defending North America’s resources from rapacious foreign (read Chinese) sovereign funds, and accelerating resource development in Canada’s north. Nearly 22 pages are devoted to Chinese State Capitalism and its impact, particularly in Africa. Her signature proposal to pay $500 in bonds to Canadians upon amalgamation plays to the worst stereotypes that Canadians have of Americans. The suggestion is an insult to every Canadian, and would constitute an unwarranted taxation of every American. Ms. Francis may call this proposal a ‘thought experiment’. I call it tone deaf. When discussing her book on Steve Paikin’s ‘The Agenda’ last November, and asked about early critiques of her book by, for example, her National Post colleague Jonathan Kay, Francis responded to his objection to the proposed buyout by saying that he (Jonathan) had not read the book, and that she presented 5 merger models and three political options. Regarding the ‘merger models’, Francis trumpets her business background as the strength of her book. In fact, the misapplication of the corporate merger model that she uses illustrates the limitations of trying to be excessively clever. A whole chapter (40 pages) is dedicated to discussing the structure of mergers as if they the United States and Canada were simply corporate entities. Of these, two are merger models, and three are deep integration models. The $500K cash payment model is in the context of what she calls the ‘Project Great Lakes’. The other is a ‘Mining model’, under which Canadians would receive a disproportionate stream of the ‘merger profits. Three other ‘Merger models’ are not really about mergers, but about limited bilateral integrations or joint ventures. Clearly, bar an environmental calamity or strategic catastrophe (Quebec separating, and the Rest of Canada dissolving) Canada is not East Germany. The governance of the Swiss confederation and its rotating presidency has zero relevance to the requirements of the megapower that a United North America would be. In fact, the European Union model is the only relevant model. Basically, the incremental harmonization and coordination of standards, policies and practices as practiced in Europe is the only reasonable model for North American integration. The difference of course is that Europe is a collection of over 40 very different states and the pursuit of political union as end state is not in the cards. North Americans, by contrast share the same culture, with regional differences. Most regional cultures in North America straddle the 49th parallel (or the lower latitudes that constitute the US Canada border in all important Ontario). See for example ‘The Nine Nations of North America’ (Joel Garreau, 1981). and the more recent ‘American Nations: A History of the Eleven Rival Regional Cultures of North America’ (Colin Woodard, 2012). Hence, whereas the European Union model is probably the end state for Europe, that is no reason for this limited model to be the end state for North America, once the benefits of a full merger become apparent. From that standpoint, the European Union model and the full-on German style merger models are not alternative options, as much as different stages of the integration process. Francis discusses the politics of union, but in very simplistic terms: The United States would acquire 30 million Democrats, southerners and social conservatives would be shut out, environmentalists who are slowing down pipelines will have the rug pulled out from under them, and a union will not tolerate the endless negotiation of aboriginals treaty claims. As if! Maybe an unfair summary, but that is the impression that a quick read brings. As to real political challenges that would fuel opposition by Canadians and Americans to a merger, hardly anything. Health care? Just give Canadians a smart card giving them free coverage in the original 50 states. Gun control, well, its patchwork anyway, so a merger will just add 10 strict gun control states. Here is the pattern: a breezy discussion of serious obstacles, and endless anecdotal distractions on matters of tangential relevance. Did you know that Professor Walter Mead proposed to President George H.W. Bush to buy up Siberia from Russia for $2 trillion? What about South Korea’s preparations for re-absorbing Korea’s northern provinces once the Pyongyang regime collapse? In fact, reading the book, one is not sure whether the objective she is proposing is further and deeper economic integration, or a political merger as the title promises. Francis makes a compelling case of the need for deeper economic integration, but she is unable to move the case along for the political merger that she (and I) champions, or to outline or set out a scenario for how the political could be kickstarted. While it is clear that in the short run, many Canadians oppose deeper integration, and most would oppose a merger these are two different constituencies. In fact, a large number of Canadians who would support deeper integration with the United States, would still oppose a political merger. Francis should have tried to address this conundrum: how to sway these Canadians to favor the full-on merger? How about swaying the many Canadians who are simply comfortable with the status-quo? The cogent case for union is yet to be set down by a more visionary champion. But for now, the best advice for proponents of a seamless and united continent is to openly acknowledge their support for a United North America, and to explain that they base their support on their considered belief that the union would benefit the majority of both present day Americans and Canadians, and would make two great nations an even greater one. ‘Merger of the Century’ at least starts that conversation. Two months ago, I concluded the last post with “to be continued.” Its now time to continue. As I left it, I was facing what I thought were hard choices, should I try to upgrade the Ubuntu installation to a newer version knowing that the update process could wreck the installed version? or just live with it? Just live with 10.04 and deal with issues as they arise. Maybe this wasn’t a hard choice after all. The purpose of that Ubuntu installation was to learn Ubuntu, and one of the mottos of this blog is “Try, test and Learn”. So to just live with an obsolete version of Ubuntu just wouldn’t do. So, I followed Option 1: Auto upgrade from 10.04 LTS to 12.04 LTS. And hey, everything went smoothly. The graphics card incompatibility about which a warning appeared during the upgrade did not appear fatal, or appear at all. Ubuntu 12.04 LTS appears stable, and I am having no problem with it that some self-education won’t resolve. The only new annoyance that I have encountered is that I am asked to authenticate myself to my wi-fi server every time I start the system. Why isn’t the passphrase saved in a key ring like it was in the previous version, and it is in Windows and MacOSX? Don’t know. One of my long-time goals has been to acquire some proficiency in Linux. How could I credibly call myself a geek without being conversant in Linux! Over the years, whenever I’d get stuck on a technical computer issue, my friend Ray would come to the rescue with a Linux based solution. He told me about Knoppix, and I tried it (that is I started from a live CD) but though it was nifty, I did not install it. A year ago, I replaced my 10 year old S4300NX COMPAQ desktop running Windows XP with a brand new Dell XPS 8300 with Windows 7, and the Compaq was set aside, thinking I would eventually install a Linux flavored operating system. That time has come. First question: Would it be Ubuntu or Knoppix. Years ago, I had downloaded images of both. I decided on Ubuntu for no reason other than it seemed (based on the number of titles of books of Ubuntu, exceeding the number those for Knoppix) better supported. I did not consider other flavors. So I had that old (?) Ubuntu CD; it was unlabeled. I inserted it in the CD drive and it loaded the operating system. The version was 8.04 (dating back to 2009). The choice was to run Ubuntu from the CD or to install it on the drive. I was ready to install it. My initial plan was to install it with dual booting, keeping XP and adding Linux. The install dialog seemed to indicate that this was not possible because there was not enough free contiguous disk space to install ubuntu. I let it go ahead and reformat the partitions holding Windows XP. I didn’t really need it. And install it did. In the meantime, I was downloading the latest version of Ubuntu (“12.04 LTS”, where LTS stands for ‘long-term support’), and burned it on a CD. I thought it would come in handy, and I would over-write version 8.04 on the Compaq with 12.04 LTS. I’ll come back to that. By now I had Ubuntu 8.04 on the Compaq. The first problem was that the computer was off the grid! No internet. The system would not recognize the Asus (WL-138g v2) wifi card. Ok, probably no driver. My first thought was to try installing the Ubuntu from the new 12.04 LTS disk, it should, I thought, have better built-in drivers,. But, oops during installation, the system crashed producing code dump that included the ominous words “kernel bug”. It seemed unrecoverable. I tried using the 12.04 CD twice: The first time booting from it, and the second time starting with the 8.04 loaded on the system and reading the 12.04 LTS from it. The unrecoverable code dump crash happened both times. In message #3, chili555 proposed a fix. He attached a driver at ucode5.fw.zip . That didn’t work for me, just as it failed for Green Moon, who first asked the question and started that thread. In message #8, chili555 proposed using b43.zip instead. I followed the instructions (again), rebooted the computer, and WOOHOO, I was prompted for my userid and password to connect to my network. Now connected, and with ubuntu installed, the next challenge was to update and/or upgrade ubuntu as much as possible. Keep using 8.04 did not make any sense. Released April 24, 2008, it had reached its End-of-Life (EOL) just over 3 years later on May 11, 2011. After a release passes EOL, security and critical fixes are no longer released. In short order I was able to update 8.04 to 8.10, then 9.04, then 9.10, all by downloading and installing fresh (but expired EOL’d) .iso images. Next 9.10 updated to 10.04 LTS using Update Manager which is included in Ubuntu. The difference (as I understand it) is that it is not possible to use the update manager to go to another (newer) EOL release, but since 10.04 LTS is still considered a Stable release, (see https://wiki.ubuntu.com/Releases), the auto upgrade path was still available. 4. Learn to live 10.04 LTS, and cope with the underlying issues. Clearly the first path would be the best, and the last, the worst. The relative advantages of 2 and 3 are not yet clear to me, especially as I don’t know if they are available as options. In fact, all of 1, 2 and 3, present challenges. Whether these challenges constitute insurmountable obstacles remains to be determined. Your graphics hardware may not be fully supported in Ubuntu 12.04 LTS. The support in Ubuntu 12.04 LTS for your Intel graphics hardware is limited and you may encounter problems after the upgrade. For more information see https://wiki.ubuntu.com/X/Bugs/UpdateManagerWarningForI8xx Do you want to continue with the upgrade? So I have i915 chips. Does that mean that I am safe since it belongs to the i9xx family of chips rather than the i8xx family. Maybe, but I still have cause to worry for three reasons. 1. The Update Manager detected a suspect chip to give me that warning about the upgrade. Maybe the i9xx and the i8xx chips are very similar and be similarly vulnerable? 2. The initial attempts at installing the 12.04 LTS distributions had failed with the code dump from which the system could not recover. 3. If I were to proceed with installing the 12.04 LTS distribution and ended with an unstable setup, I would have to restart with an older distribution and start again, since I assume there is no elegant downgrade path from a newer unstable setup to an older more stable one. This is the same approach I took to apply the updates from 8.10 to 9.04 to 9.10. If none of this applies, then please report this bug against the ‘update-manager’ package and include the files in /var/log/dist-upgrade/ in the bug report. b. Upgrade through ‘Update Manager. Well, lets start with Firefox!. The version of Firefox in 10.04 LTS is 20. I downloaded a version 23 package from the mozilla website. However, I found no instructions as to how to install it. The advice is to use the installed package manager to upgrade Firefox. But the package manager does not work since 10.04 LTS is no longer supported. 4. Just live with 10.04 and deal with issues as they arise. I am not a historian, and the 1914-1918 World War is, to me, remote, both culturally and in time. I never had a particular interest in, or knowledge of that that war, save for historical documentaries depicting the carnage of trench warfare, or being in Canada, Vimy Ridge, which commemorates a battle where Canada is said to have come of age. Yet, unlike the Second World War, whose causes and origins are generally known to most well educated or historically aware North Americans, the origins of the earlier world war are mystifying, and shrouded in a historical fog. Why would Germany and Britain and France and Russia and Austria-Hungary have gotten into this mess? What intrigued me to read this book was a joint book review in the New York Times http://www.nytimes.com/2013/05/12/books/review/the-sleepwalkers-and-july-1914.html of July 1914, and The Sleepwalkers. The review by Harold Evans, former editor of the Sunday Times, sparked my curiosity by focusing on the origins of that war that turned the world upside down. How could a world at peace in June 1914 turn into a catastrophic war by August 1914? In July 1914, McMeekin gives a day to day account of the chief actors of the participating countries from the assassination in Sarajevo of Archduke Franz Ferdinand, the Austrian heir to the throne on June 28, to the beginning hostilities on August 4. From that incredibly detailed reconstruction of the events, it would seem the parties were not merely sleepwalkers (as the title of the other book reviewed by Evans implies) but cogs in an elaborate Rube Goldberg machine with no off switch. Each of these countries had a war party pushing for brinkmanship (or worst), but none willed a world war. All these countries had parties that wanted to pull from the brink, but were unable to. Why unable? Not because their respective war parties prevailed upon them, but merely because they were instrumental in setting in motion processes that they would not, or could not reverse. There are moving depictions in the book of diplomatic envoys breaking into tears after presenting their host countries declarations of war. Two things about that epoch strike the contemporary mindset as particularly distant. The first of these is the importance of something called the “monarchical principle”. Germany’s envoy to St. Petersburg, Russia’s capital at the time, appealed to the Tsar to back down from pursuing policies that would lead to the war, on the basis of that it would undermine this “monarchical principle”. But what exactly was the monarchical principle? Save for the French Republic (whose alliance Romanov Russia counted on, in spite of France being viewed by the Tsar as an “atheist republic”), all other countries of Europe were monarchies including Serbia which provided Hapsburg Austria with its casus belli. So, what exactly was the “monarchical principle”? As far as I understand it, it went beyond the protection of the ruling monarchies and was a belief that Europe’s monarchs, their kings and emperors, Germany’s kaiser and Russia’s tsar, were entrusted with the stability and peace of the continent of Europe, or maybe even ordained as custodians of European civilization. The second thing that grates on the modern sensibility is the importance of “mobilization”, as in “war preparation”, to strategic thinking at the time. Basically, “mobilization” was tantamount to war. Once Russia’s mobilization had commenced, it was just not feasible for the powers that be to reverse course, even if chances for peace presented themselves. A discussion of “mobilization” segues easily into a discussion of technology, and in particular communication technology. Arguably, the countdown to war in July 1914, could not repeat themselves in today’s world. Why? Because then, communication technology was so primitive that essential communications between the leaderships of the countries that would eventually fight each other took hours, if not days, to reach their destinations. Slow communications contributed to opaqueness about what adversaries were up to, and therefore to distrust of the other. Readers may object to my stating that the events of July 1914 would be unthinkable today. Of course, war is not a thing of the past. But today, communication technology is pervasive, and if, or when, countries fight, it is in spite of instant communication, not because of communication failure. One more point to note: the author, Sean McMeekin, an American professor at a Turkish University, anticipates some readers comparing the Austrian ultimatum to Serbia, with the 2001 US ultimatum to Taliban ruled Afghanistan: hand us Bin Laden, or bear the consequence. But the difference is critical: Serbia responded positively to Austria and seemed to be open to allaying its concerns, to the Talibans hospitality for, and loyalty to Bin Laden was paramount. It may seem disconcerting to finish a review of a book describing events that are nearly a century old by bringing up Afghanistan and its Taliban parasites. It shouldn’t be. History at its most interesting and riveting, is when it clarifies, and maybe explain the present. How to Record from your digital TV? When television was in its middle years and receivers were analog, videocassette recorders (VCRs) were a most common accessory. People would record their favorite shows on VHS (or Beta) tapes to watch later and reuse, or in many cases for pack rats to keep in their collections. Now, televisions are digital and at least for consumers who get their tv by cable (or from satellite), PVRs have replaced VCRs. Yet, nothing has really replaced the VHS tapes. My collection of recorded television shows stopped growing when our digital television replaced the old analog one. [That may be a good thing, but that’s another story]. Why this is so is another story! In short the television stations, but mostly the cable companies were worried that viewers would make perfect copies of their shows and collect them, or skip the commercials when playing them back. So the cable encrypted their signals and Personal Video Recorder (PVR) manufacturers only sold units that combined signal decoders with recorders and these units would be locked to particular cable operators. You can buy your PVR from your cable company, or from your local electronic big box store but still locked to particular cable companies. This is the same business model as for mobile phones. But what if you really wanted to save a copy of a show off the PVR to play back on a computer or another device? This post is about how I went about doing it. Let’s start by looking into the question of what is a PVR. 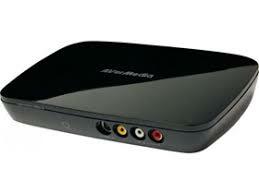 It is digital set-top box combined with a digital video recorder. As far as I know, there are digital set-top boxes sold without recorders but digital video recorders sold by themselves are a specialty accessory. The set-top boxes by themselves are only devices that receive an encrypted video signal through broadband cable, decrypt them and pump them out to the television monitor. The PVR adds a hard drive to optionally record shows for later playback. But these recordings cannot be accessed by a computer connected to the PVR via USB, and needless to say, PVRs don’t come with DVD recorders. So even if you physically removed a PVR’s hard drive and placed it in an HD enclosure (bye bye warranty!) and connected it to a computer, you would be no further ahead, because the video files on the PVRs hard drive are encrypted, and can only be decrypted within the PVR unit. So the only way to get around this obstacle is to play back the recorded video, but instead of pumping the video to the television, one would send the video signal to a computer where it could be recorded. But how? Basically these two products do the same thing.and that they even come bundled with the same recording software from Arcsoft TotalMedia Extreme. They both accept Digital Video Capture from the Component (YPbPr) output of the Set-Top PVR, and transcodes it in real time to H264 for saving on the computer. I bought the AverTV unit because of slightly better reviews on the internet (“more solidly built”) and its slightly lower price. Next came the installation, both hardware and software. While the hardware installation should in principle be straightforward, a slight problem arose: while the quick install guide sheet that came with the unit could bear some improvement (better illustrations), the puzzlement was why the component cable that came in the package was marked as intended for the output ports of the AverTV box rather than for the input? The guide clearly indicated ‘cable not included’ besides the input ports. Why assign the included component cables to the output ports, rather than to input? Who knows! In any case I had a second set, and I connected one end to the YPbPr output port of the PVR, and the other to the input ports of the AverTV box. I also connected a USB cable from the AverTV box to the computer. The software, (Total Media Extreme ‘TME’) from Arcsoft, as well as the AverTV driver had already been installed on the PC. So with TME launched, I entered and started the record component of TME; the source was recognized right away to be the AverTV, and yeah, the audio came on live right away, but alas no video! What was going on? Was the driver not installed properly? Was the AverTV unit defective? Maybe the cables were defective or not connected right? Or maybe there was no video being pumped from the Set-top box? Well I checked and reinstalled the driver, wiggled then changed the component cable. How would I test if the AverTV hardware unit was working properly, or defective? I don’t know, but noticed that the lights on the front of the unit were yellow when all the illustrations online showed them to be blue. That was a clue, but only a clue, as I could find no guide to the meaning of the indicator colors. Anyway, I took the clue to mean that there was no video being received, but why? 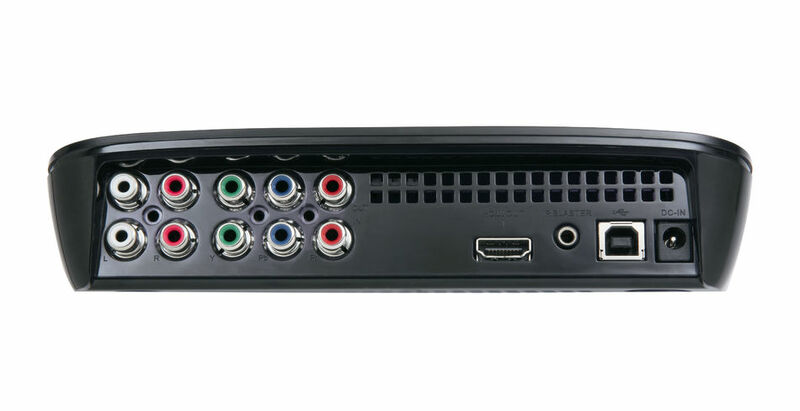 Before buying the AverTV DVR, I had inspected the ports at the back of the Rogers branded and locked Cisco Explorer 8640 HD PVR. There was the HDMI port sending video to the TV, there were composite ports and S-Video ports to send signals to old fashioned analog TVs, and there was the component YPvPr ports for sending signals to HD TVs as an alternative (?) to HDMI. I have a Pinnacle USB video capture device for capturing analog videos, and indeed it captured low res video when connected to the composite ports of the PVR. So if the composite ports worked, why not the component? Could the output port be selected programmatically? I searched the online manual for the PVR, but nothing there showing how to bring the YPvPr ports alive. Think of your mobile phone: typically the audio comes out of the unit itself. If you add an external speaker, the internal speaker was silenced. Maybe the same happens here! So I thought what if there was no HDMI. So I pulled the HDMI cable out, and eureka, it worked. Yay. Now doing all that is really a pain. In my case recording requires me to pull the PVR out of a cabinet that has no open back, pull out the HDMI cable, and when I’m done reverse the process, insert the HDMI cable back into the back of the PVR. And of course, when copying PVR clips to the computer, I cannot watch anything on TV. Clearly all this is annoying. I have no idea if there a better way to record, and specifically to send the PVR signal to the YPvPr ports without pulling the HDMI cable out. Is the PVR engineered this way for technical reasons, or simply to discourage digital recording. I really don’t know. Posted on February 10, 2013 October 16, 2018 12 Comments on How to Record from your digital TV? No CBC Music in Canada …. on Squeezebox Radio! For the last year and a bit, I’ve been the happy owner of a Logitech Squeezebox Radio. I am still happy. I use it to listen to my favorite far away radio stations in super clear digital sound and of course without needing to turn on a computer. Some of the stations I listen to include NOLA’s heritage radio station wwoz.org, heartland public radio (hpr.org) and classicandjazz.net from Paris, France. I also listen to local stations like Jazz.FM and their associated special web streams. In fact I use the squeezebox radio as my wake up alarm. The way this works is to create a list of favorite radio streams on a logitech run website: mysqueezebox.com, to which squeezebox radio connects. There are other ways to use the radio, but these others ways are not relevant to this blog post. Among the local stations I listen to once in a while are those of the mother corp, otherwise called the CBC (canadian broadcasting corp). CBC has three radio networks, CBC 1,(news and public affairs), CBC Radio 2 (music) and CBC 3 also music. The direct streams for all these broadcasts are available on the CBC website and play well on the computer (using my favorite media player VLC, from videolan.org ) as well as on the squeezebox radio. CBC also has web only music streams. Until just a few months ago, there were only 4: classical, jazz, singer-songwriter and canadian composer. Now they expanded and there are nearly 40 of them in a service called CBC Music.. The list is at http://www.cbc.ca/radio/# . . and also at http://misener.org/archives/1266 Now with so many new streams, I thought I could add more variety to my squeezebox radio and particularly to use for my wake-up alarm. So I put those streams into the favorites at mysqueezebox.com and turned the radio on. Instead of hear the great music, I get this: “403 Forbidden”. That was a head scratcher. The stream plays well on vlc, but not in squeezebox radio! I was stymied. Just looking at the direct URLs of the streams that work in both vlc and squeezebox (like CBC Radio 1) and those working on vlc but not squeezebox (like CBC Radio Jazz), I could see no obvious clues for the problem. Now stymied, it was time to google. I searched for “cbc music streams forbidden”. The Sixth hit was: Re: [Banshee-List] Is there something wrong with this stream? Unfortunately, CBC Music’s rights agreements do not allow the majority of our 40 online radio streams to broadcast outside of Canada. There are 3 stations that you can listen to worldwide: CBC Radio 2, CBC Radio 3, and CBC Records. Eureka: The Squeezebox Radio is connected to mysqueezebox.com which is located outside Canada. So it was mysqueezebox.com that was forbidden from receiving the music channels, and my squeezebox radio was downstream. The solution then for this problem would be to establish a squeezebox server in Canada, like on my Network-Attached Storage device, the dns-323. Posted on April 29, 2012 May 8, 2012 8 Comments on No CBC Music in Canada …. on Squeezebox Radio! So some months ago, I was walking to the coffee shop with my colleague, and she popped up this question, “Do you mind if I ask you a question as an atheist?”. I am flabbergasted by the question and ask back, “What does that have to do with atheism, or belief in God?”. I then explain to her that her one question was really two questions, the first was “Do you think aliens have visited planet earth in UFOs?” Answer: I know of no credible evidence that such visits have occurred. The second question being “Do you think that there could be life elsewhere in the universe?”. My answer is “Sure, why not? Its possible”. My colleague then explained how her question about UFOs related to atheism and belief. She explained that as a Catholic, now “non-practicing”, she had been taught that if one believed in God, one could not also believe in the (possible) existence of life elsewhere in the universe, since we (humans) are unique, and God created us in his image, etc., etc. We drank the coffee, and went back to our desks. I was figuratively shaking my head, just an oddball question, and that was that, or so I thought. So what explains this obsession by some Christians with atheists’ views about aliens, UFOs or whatever? My colleagues question, and that question in Irvine happened around the same time. Is there some kind of a meme circulating out there? I don’t recall that question coming up before! Fast forward to early December: The Huliq News website (No, I never heard about it before!) wrote that “The Vatican scientists approve of evolution and alien life”. Here is what the Jesuit astronomer Father Jose Funes is quoted as saying: “As a multiplicity of creatures exists on Earth, so there could be other beings, also intelligent, created by God. This does not conflict with our faith, because we cannot put limits on the creative freedom of God.” Maybe this is damage control by the Vatican designed to snuff the UFO meme circulating among their flock, but whatever reason it is bully for them. In an earlier post, I explained the name of this blog, “Try, Test and Learn” to mean that I wanted to learn the ins and outs of WordPress. Maybe I’ll learn something about WordPress with this post, but that would be incidental to its purpose which is simply to write an account of a video conversion and manipulation project which occupied many evening and weekend hours over several months. My friend (and boss) John MacMillan, (‘Mac’) is also a stand-up comedian. Last February, he, together with several other guest artists who are also my colleagues, performed for charity at the Pilot, a Toronto jazz club. The show was professionally videographed, but several months on, Mac had not released any of the recordings. I asked why, and he explained that: 1. There were 9 files, 22.06 GB in all, and therefore unmanageable, and 2. they didn’t play properly. I was intrigued by the problem and asked him what he meant. He brought his new MacBook Pro, and clicked on one of the smaller files. The files had the .mov extension which was associated on his machine with QuickTime. Alas, QuickTime responded with “The document “Feb11-2011-02.mov” could not be opened. The movie is not in a format that QuickTime Player understands. You may need to install additional software to open this time of file” The options were “Tell Me More” and “Ok”. “, but not saying which additional software was needed. I suggested he try VLC. VLC showed the Video, but no sound. Stumped, I asked him to give me one of the smaller files so that I examine them on my own. So he have me a copy of the 2nd file of 9. It was 293.8 MB and 64 secs long, and I set out to figure out what was the problem with it. I tried again playing it in all media players I had on my MacBook Pro and my Windows machine. VLC (Mac and Windows): Video, No audio. In any case, it was clear that even if I was to be find a player that would play the .mov files natively, I would have to drastically reduce the total file sizes; 22 GB for two hours max of video was insane. My task would be to make the files playable, and to make their size manageable. Two hours of video should fit nicely on a standard DVD. A videographer friend of my daughter, Janet identified the original files as being native to a Sony XDCam. In converting the files, I wanted the resulting video file to be as close to the original as possible, ie. Resolution 1980 x 1080, and audio in stereo, (or two channels). Of course, the resulting file had to pass the subjective look and hear test, and to be reasonably sized. I tried several converters, generating test file after test file. 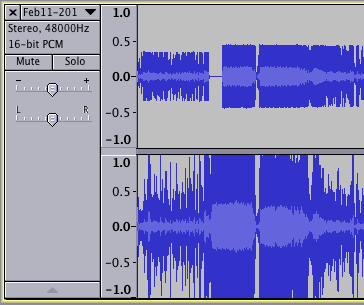 For example, an .avi file looked fine, but the audio was mono. Mr. Video Codec (my nephew, Anthony J) recommended that I “transcode … to H.264 (Main or High Profile) with AAC audio in an MP4 or MOV container, (I) should get very nice quality at about 5 Mbps.”. So I had to find a converter that encoded those specs. After trying several converters, I found the Mac version of the free Kigo Video Converter (http://www.kigo-video-converter.com/free-video-converter-mac/ ) and it seemed to fit the bill. When converting to MP4, Kigo offers 3 codecs: xvid, mpeg4 and x264. 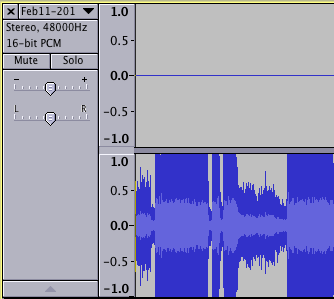 Among Audio settings, I chose the aac codec, and audio channel: 2, (assuming this to mean that two channels were retained after the conversion. There is a choice for A/V sync with the choices being ‘default’ or ‘basic’. I tried both settings and didn’t notice any difference. The resulting .mp4 file seemed just fine. The .mp4 played in most players, the sound was in stereo and the file size was reduced from 293.8 MB to 7.3 MB. With this solution in hand, I asked Mac to send me the remaining 8 MOV files for similar conversion. With these, I proceeded to apply the same conversion using Kigo to them. While some of the resulting .mp4 files were fine, (at least) one had no sound, and another had a two minute stretch of silence in the middle. Clearly it was time to “go back to the drawing board”; What could have gone wrong? Was there really no audio on one of the recordings ? I google for another video converter, and found HandBrake. ( http://handbrake.fr/). In my first attempt, the result was the same as with Kigo. No sound. I then noticed that under the audio settings, there was a button “Add All tracks”. By default, only Track 0 was showing. I pressed the “Add All Tracks” button, and Track 1 was added. I carried out the conversion, but still no sound. One last try, I thought, what about deleting track 0 ? BTW, Handbrake has another interesting feature: A preview functionality. Basically, it allows you to encode a 7 second snippet to check the result of the settings before going through with the conversion, and yes indeed, by deleting the empty Track 0, the conversion was successful with both video and audio. The original 7.24 min .mov was 2.03 GB, the result only 248.7MB. The solution was to run Handbrake adding both tracks, with their order reversed, ie. track 1, before track 0, and that worked. One thing I must state on the record: a lot of what I was doing was really “Trial and error. Some things worked, other didn’t, and sometimes I would rerun a conversions with what I thought would be the same settings and get better or worse results. Frankly, I didn’t know exactly what I’m doing, just trying one thing after another. So if you were to try following the steps I describe, I wouldn’t be surprised if slightly different results came about. In any case, I eventually had all 9 .mov files converted to much smaller mp4s. The 22GB of .mov files were now 3GB in mp4s. The initial task was now complete. Of the 9 files, 6 were uninteresting short outtakes, leaving 3 for further processing. Number 9 was a discrete clip of one act. Number 6 was a continuous 54 min clip that needed to split into 4 parts, and Number 5 was the continuation of the 4th segment of number 6. So how to split an MP4 video file, and secondly how to splice (merge) two MP4 files together. 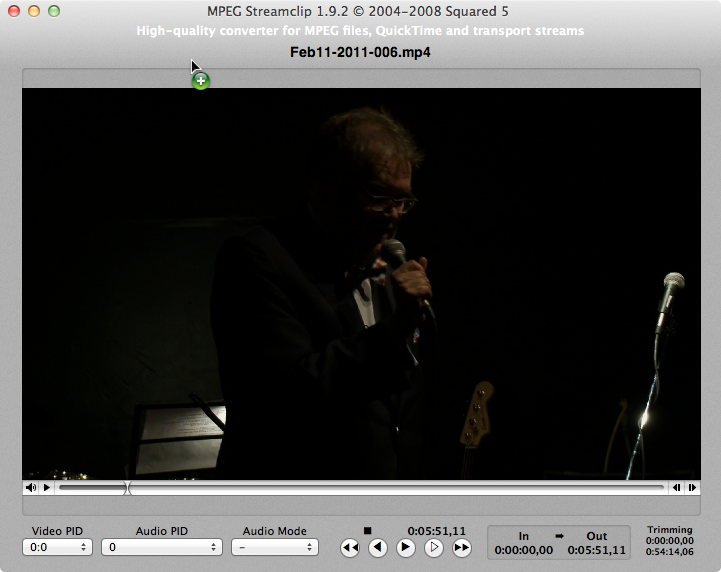 For splitting the MP4 video file, I used MPEG Streamclip (http://www.squared5.com/). Just open the source file, play it until the spot where you need to apply the cut, and press “O” (or out). Now to continue, play the original video clip, and select the rest of the subclips by pressing “I” (for IN), and “O” (for OUT), and save them in the same manner until all required subclips are saved in distinct files. The final step in the manipulation of the clips is to splice two video clips together, specifically to follow Feb11-2011-006-4.MP4 with Feb11-2011-005.MP4. Yes, File 006 is followed by 005. The splicing tool I used is SimpleMovieX ( http://simplemoviex.com/SimpleMovieX/info.html). The SimpleMovieX website has a tutorial to demonstrate how to join the two files: How to merge Movies. The tutorial shows two methods: The first involves pasting the video files on to the SimpleMovieX window, one after the other, but I couldn’t get this method to work. The second method involves pasting the two files at the same time. SimpleMovieX the asks if the files should be ordered by date or by name. In my case, the file dates were the same, and the file names gave the wrong sequence. So I just added ‘1’ and ‘2’ as prefixes to the files and pasted them to the SimpleMovieX window, and then save it from the File menu. I saved the merged file as a .mov, as the save as MPEG-4 option was greyed out, probably because the SimpleMovieX I was using was a Trial version. But the mov was good enough for me. Now, I had 4 MP4 video files and 1 MOV video file. The original task of turning the original raw files from the event into smaller playable video files was finished. Next I put together these files into a DVD image and burned it to a disk. For this, I used the iDisk application that was included with Mac OS X. Describing this process is outside the scope of this post. In countries that uphold freedom of association as well as freedom of speech and expression, why does freedom of religion require special mention? Let’s see how these are expressed in the Canadian Charter of Rights and Freedoms (1982), the Canadian Bill of Rights (1960) and in the 1st Amendment to the US Constitution (1789). So the Canadian Charter upholds freedom of religion and conscience, as well as thought, belief, opinion and expression and freedom of assembly and peaceful association. The older Canadian Bill of Rights proclaims the existence in Canada of freedom of religion; freedom of speech; freedom of assembly and association; and freedom of the press. By contrast, the First Amendment to the US Constitution declares that “Congress shall make no law respecting an establishment of religion, or prohibiting the free exercise thereof; or abridging the freedom of speech, or of the press; or the right of the people peaceably to assemble, and to petition the Government for a redress of grievances”. While the Canadian documents express the freedoms of religion as positive rights and the US document expresses the rights as limitation on the rights of Congress to legislate in respect of religion, the question remains, why is religion plucked for special mention? How can the freedom of religion be abridged except by also abridging freedom of speech, freedom of peaceful assembly and association and freedom of the press? There are two possible answers to this question? The first answer, is that freedom of religion is included for emphasis, because it is said, that religious freedoms are the first rights that are undermined. So declaring that freedom of religion must be upheld, is really a symbolic declaration, which though redundant, acts as a canary in a mine: Undermining the freedom of religion is an advance signal that other freedoms are in jeopardy. This answer makes sense in many third world countries, where the freedoms of expression, assembly and association are routinely abridged. The Pew Center recently released a study that catalogs how restrictions on religion have increased in recent years. But a careful reading of the report shows that in each case where religion was being restricted, freedom of association or expression was being undermined. Freedom of religion was precarious precisely because freedom of speech/expression and freedom of assembly and association are themselves in jeopardy. Unfortunately in many third world countries, religion resonates with the public more that other more intellectual modes of thought. So upholding freedom of religion is really a proxy for other freedoms. The second is that there is something special about religion and that adherents should receive special recognition and privileges, eg special considerations in law, exemptions from generally applicable law, etc. In the context of advanced Canada, the United States and other free countries, this response doesn’t make any sense, and undermines equality before the law. It is not clear why religion must be accommodated and privileged. In the recent polygamy prosecution in British Columbia, the polygamists defended themselves by arguing that the regulation of polygamy was an infringement on their freedom of religion. The examples of the special accommodations of religion in both Canada and the US are too numerous to list. The question to religionists then, is Why? What makes you think that your beliefs deserve special accommodation and privileges that are not afforded to comparable secular philosophies. It is high time you explain yourselves, rather than assert a dubious entitlement to special consideration. This debate: Against Religious Freedom” inspired me to write this blog post. Read it! Maryam Namazie: Never be afraid to doubt and voice dissent. This is a wonderful video that should be watched from beginning to end. It is an ode to individual conscience and moral autonomy. Yes, THINK (CRITICALLY) FOR YOURSELF, and when the time comes to say NO, Say it, Loudly, Proudly and Clearly. No, Enough is Enough. PS: Thank you Maryam Namazie, for sharing this video. You are a Communist, and I am the farthest you can go from a Communist. This just shows that integrity trumps ideology!